CyberLink is leading the way with new disc technologies, providing complete solutions and advanced features for Blu-ray Discs. CyberLink DVD Suite lets users do everything they want with video and discs: authoring and burning, data archiving, disc playback, slideshow creation, HD video editing, photo retouching, music ripping, label printing, and data burning. As a complete suite of CyberLink´s most comprehensive range of software, CyberLink DVD Suite features advanced technologies for enjoying and creating the latest audio and video disc formats. The PowerStarter interface supports task-based operation of burning and creativity features, and provides an easy means to update and enhance products online. Featuring support for the capturing and output of high-definition video, PowerDirector HD video editor allows the speedy creation of content for display on high-definition monitors. Magic features automate the HD video editing process, allowing you to create complete movies featuring effects, music, and titles. 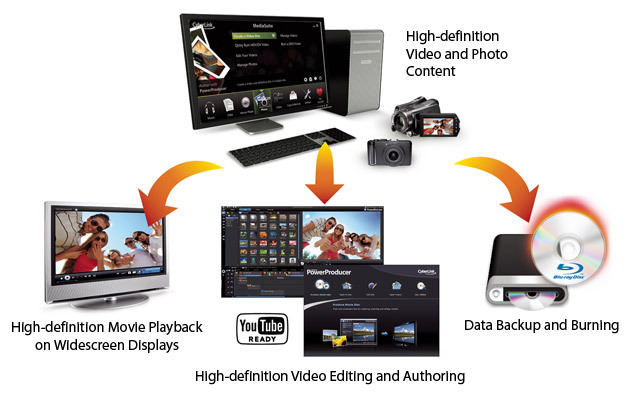 Users can output in MPEG-2 HD, MPEG-4 H.264, and WMV-HD formats. Digital video editing software, PowerDirector, supports the capturing, importing and output of AVCHD video. CyberLink PowerDVD, consumers' favorite HD playback software, supports the playback of high-definition video formats and Blu-ray Discs. As the industry-leading media player, CyberLink PowerDVD also supports a complete range of other key video and audio formats, including MPEG-2 HD, MPEG-4 AVC (H.264), WMV-HD, MLP Lossless, DVD-/+VR, DivX Pro, DTS, Dolby Digital, and MP3. Support for these and CyberLink´s own audio-video technologies continues to give users the broadest range of options for enjoying high-definition audio and video content on the PC. With stylish menu features, enhanced authoring tools, and intelligent video and burning technologies, PowerProducer makes quality BDMV disc authoring quick and easy. BDAV support lets users burn their high-definition video directly to disc, using CyberLink´s Right-to-Disc technology. Video files can also be imported and encoded using the BDAV format. CyberLink Power2Go provides a quick method of ripping, burning and copying files via a choice of advanced and express modes. Power2Go supports Blu-ray Disc burning and DVD-R double-layer (DVD-RDL) recording. Blu-ray Disc support allows the burning of 25 GB on a single-sided disc. Meanwhile DVD-R support lets users store up to 8.5 GB of data by burning high quality video, TV recordings, data, music, and photos onto double-layer DVD discs. CyberLink InstantBurn is a packet-writing solution that lets users operate a disc burner as if it was another hard drive or a huge portable USB storage device. Once launched, InstantBurn runs in the background, requiring no other burning software to operate. Users simply drag and drop files onto their disc burner located under My Computer, or open, save, cut, copy, paste, and rename files and folders as if they were located on a hard drive.